In this unit we’ll cover how to set up the Dial by list and SMS by list functionality of Fastcall. This functionality helps you contact large numbers of Salesforce records, which is useful for an ‘outbound call center’ type of setup. Both Dial by list and SMS by list are extra capabilities that must be enabled by Fastcall support. 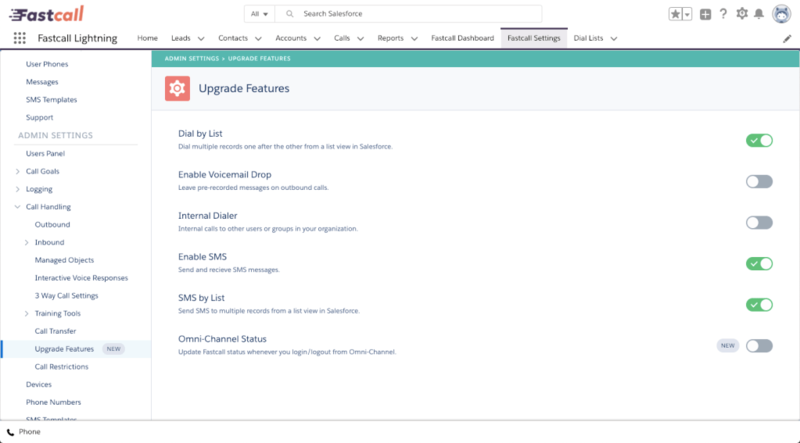 Once the capabilities have been enabled in your Salesforce org, you can turn on Dial by list and SMS by list in Fastcall Settings > Admin Settings > Call Handling > Upgrade Features. In order for your users to use the functionality, you need to add the relevant control to the Record Search Layouts in Salesforce Settings. In the ‘List View’ layout, add ‘Dial with Fastcall’ as a button. This button controls both Dial by list and SMS by list. The button will now appear in List Views for that record type.